While composer extraordinaire Michael Nyman is well known for his soundtrack work, vocalist David McAlmont remains an under-appreciated artist with an amazing array of releases to his name. McAlmont's career began with the short-lived duo Thieves in the early '90s. After a handful of recordings, the band split and McAlmont released those recordings under his own name. Though the album was well recieved, it didn't set the charts on fire like it should have. Soon enough, David hooked up with former Suede guitarist Bernard Butler and released two singles and a mini album before they, too, split. McAlmont & Butler did achieve plenty of press and success in their short time together, but their collaboration was not meant to be... for the time being, at least! McAlmont then released the album A Little Communication to great critical success, but, once again, the public didn't take to him like they should have. By 2002, McAlmont & Butler were back together and released the lushl and beautiful Bring It Back album. The album faired well, reviews were solid, but alas, the duo went off and did their own projects, leaving their collaboration on hold yet again. McAlmont released Set One: You Go To My Head in 2006, an album of sweetly sung standards. While his back catalog is top notch, The Glare is perhaps David McAlmont's finest moment to date! 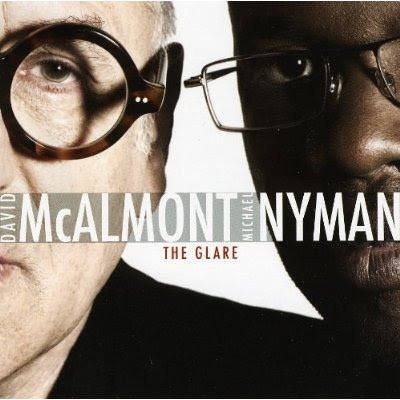 While I haven't researched on just how McAlmont hooked up with Michael Nyman, this collaboration is brilliant on many levels. First off, David's vocals are still as beautiful, romantic and emotional as ever. Then, Nyman's compositions are the perfect vehicle to carry McAlmont's angelic vocals up to heaven. The arrangements are top notch, hitting so many nerves from soft and gentle emotions to euphoric joy. There is absolutely nothing wrong with this collaboration apart from the fact that it lasts just a few minutes over the half-hour mark. Thankfully, there's a wonderous 17 minute Nyman instrumental that closes out the album in grand style. People should really know who the hell David McAlmont is. If you don't, then do yourself a favor and start with this release.